What Am I Looking At? I was recently given the opportunity to test the Sierra Design’s Convert 2, four season tent. I had not used a four season tent in the past, but was painfully aware of some of the shortcomings of using a very lightweight three season model during the winter months. By contrast, this was one solid shelter. There was a price to pay in the weight department, but not a terrible one. As always, before heading out into the field, I try new equipment at a location where my house is an easy fallback. Everything was packed nicely in a “burrito” bag not much larger than a similar three season tent. The 15 stakes and three poles all fit within a single compartmentalized sack inside. I immediately noticed everything about this shelter was heavier duty than I was used to. Overall “fit and finish” was excellent. It was obviously well made. The tent went up intuitively and quickly. Being four season, there was no exposed mesh. I did not turn the hose in it, but it seemed obvious that the tent could be set up in the rain without much water intrusion before the fly could be put on. Staked down and even using just some of the guylines, the pitch was rock solid. The sides and doorway are nearly vertical, making the tent seem extremely roomy. Two pads and bags fit side by side with floor to spare. The high (43 inch) peak height was outstanding as far as comfort. The 16.4 square foot vestibule was cavernous, with the door set to one side to cheat the winter wind when entering or leaving the shelter. This was a tent I could see being livable through a winter storm if necessary. It packed up easily and fit back in it’s storage bag. It was time for a real world test. Former co-worker and fellow backpacker Bill and I were planning a November trip, but the weather doesn’t always want to cooperate at that time of year in Ohio. However, since I wanted to test the tent, the forecast of rain turning to snow, high wind and a low in the mid-20s wasn’t a deterrent. We would be hiking the backpack trail at Tar Hollow State Forest. Despite the touristy name, the trails are fairly rigged for the Midwest. It was pouring rain on the drive out, so a second breakfast at McDonalds was in order. The delay ended up giving us around six hours of light to hike the 12+ miles we had planned. A light rain was falling as we began. Bill was carrying his Nemo 3 season tent, so I decided that I’d have no need for the Convert’s vestibule. That decision saved me a bit over a pound in the pack. That was a good decision as the trail was wet, creek crossings were numerous, the hills were steep and switchbacks were non-existent. It’s not often a trail is steep enough that I feel I’m hiking face to face with it, but that was the case in a few spots. Conditions slowed us a bit, and with the late start, we arrived at the designated camp area in the dark. As no one else was enjoying the Tar Hollow camp experience, we had our choice of spots on the ridge and found a nice flat area without any standing water or apparent widow makers. The rain had quit, replaced by occasional showers of ice pellets while we set up our tents by headlamp. Again the tent went up quickly and my sleeping bag, pack and all my gear fit in with room to spare. The large doorway is waterproof when closed, so the vestibule would not be missed. I christened the tent, The Palace. With the wind beginning to howl, I made sure to guy out the sides of the tent. Utilizing a sliding ring, high and low guy out points are both used while only needing one stake. The Palace was quickly locked down and steady. We kept a fire going for a while after dinner, but eventually the increasing wind, dropping temperature and ice pellet showers drove us to our respective tents. Since I’d be needing every bit of my 23 degree bag’s warming power, I kept The Palace zipped up tight with the foot area venting closed. It would be a good test of the material’s winter weather breathability. Night’s are long in November, but I slept through the night, warm and dry. Despite the wind, the Convert’s fly remained taut and quiet. The temperature was in the mid 20s by morning. In Bill’s tent, his water froze. Mine did not. In addition, I had no issues with condensation whatsoever. For cold weather camping, this was one impressive tent. Additional time spent with the tent only reinforced my positive initial impressions. The convert 2 is a well made, roomy, livable 2 person, 4 season tent. For one person, It’s downright palatial. However, as with any tent, there are compromises. While light and price competitive with other four season tents, it is heavy and expensive compared to most three season models. It all depends upon what you are looking for. This is not the tent to take on a summer thru-hike. However, if you’re thinking about expanding your camping horizons into the winter months or well into snowy mountains, this is a great piece of equipment. The two-wall design with a breathable (not mesh) inner wall works well to keep in warmth and let out moisture vapor. • The weight, while heavy compared to a three-season tent, is light compared to other four-season tents of its size. • The removable vestibule can reduce weight when not needed but adds significant covered space. • The vertical walls and high peak make the tent very livable during bad-weather days. • Tent stakes are T-shaped, tough, and grip well. However, the tops were not machined off at all and are sharp. You’ll need to wear a glove when sinking the stakes by hand. • Two small pockets are adequate, but no more. • The suggested retail price is in line with comparable tents at $499.95. • A footprint is available. It will add nearly ½ pound to your pack and subtract $30 from your wallet. Bill, a former co-worker and fellow backpacker and I were trying to plan a short November trip, but the weather doesn’t always want to cooperate at that time of year in Ohio. However, since I wanted to test a new winter tent (Sierra Designs Convert 2), the forecast of rain turning to snow, high wind and a low in the mid-20s wasn’t a deterrent. We would be hiking the backpack trail at Tar Hollow State Forest. It was pouring rain on the drive out, so a second breakfast at McDonalds was in order. The delay ended up giving us a bit under six hours of light to hike the 10 or so miles we had planned. Despite the touristy name, Tar Hollow’s trails are fairly rugged for the Midwest. They meander through both 600 acre Tar Hollow State Park and the larger, surrounding Tar Hollow State Forest (16,000+acres). Located in Ross, Vinton and Hocking Counties, east of Chillicothe, Tar Hollow is a rugged landscape originally named after the pine tar pulled from the native pines growing there. The park is not as developed as your typical State Park but does offer a 15 acre lake, trails and a few camping options. The Logan Trail is a backpack trail which is laid out in a pattern resembling a figure eight. The only trailside camping permitted is within the state park near the center of the eight and a large fire tower. The area consists of five small campsites that share a latrine. There is no potable water at the camp area. Stopping at the park office we paid the $4/person/night fee for the “backcountry” camping. There are two trailheads typically used by hikers. In an effort to keep things simple and easy, we began from the fire tower as a light rain continued to fall. Of the two loops, the southern spent more time in the forest and less in the park, so south it would be. Trail intel gleaned from the Interweb stated the trail was marked significantly better if hiking in a counter-clockwise direction, so that’s the way we went. This trail was originally constructed by the Boy Scouts. It is generally maintained well and marked well, but don’t expect to see a switchback. Several sections have been maintained through the use of a small bulldozer however, and were not quite the immersion in nature a singletrack trail provides. The two loops run together for a bit less than ½ mile, then the South loop splits off. A drop and a few subsequent climbs made me wish that the word switchback had been in the builder’s vocabulary. With the ongoing rain, the slopes were slick. It’s not often a trail is steep enough that I feel I’m hiking face to face with it, but that was the case in a few spots. Creek crossings were numerous, but even with the rain, were not typically tough to cross. The late fall color was still pretty good and although wet, the scenery was ruggedly beautiful. There was one spot where the trail marking failed us. Nearly five miles in, we were walking on a ridgetop on what appeared to be an old service road. An obvious trail, blazed in red, dropped off the ridge. There were no blazes or signs in sight continuing straight, so we followed the blazes. It was one of the steepest drops of the trail and the maintenance level dropped as well, but it continued to be well blazed. After a half hour the forest opened into a meadow that was obviously the Camp Dulen Boy Scout Camp. We were a mile off the main trail. A posted map showed the camp at the end of a loop, so rather than backtrack, we continued onward. This was quite possibly a mistake as the trail degraded significantly. It seemed as if this portion of the trail had been abandoned. Where the trail “disappeared,” we navigated from one faded blaze to the next until we reached a better maintenance level in time to reclimb the steep slope. On the plus side, the rain had quit by the time we were back on the main trail. We walked right by our mistaken turn and were reassured that it was poor marking, and not our poor navigation that resulted in our detour. However, the side trip cost us an extra two miles, conditions had slowed us a bit, and with the late start, we ended up hiking in the dark. Despite having to deal with the remains of some timbercutting in the dark, we arrived at the designated camp area without any other issues. As no one else was enjoying the Tar Hollow camp experience, we had our choice of spots on the ridge and found a nice flat area (area 124) without any standing water or apparent widow makers. The rain had quit, replaced by occasional showers of ice pellets while we set up our tents by headlamp. The “test” tent went up quickly and my sleeping bag, pack and all my gear fit in with room to spare. The large doorway was waterproof when closed, so my decision to leave the removable vestibule at home was a good one. I christened the tent, The Palace. For a full review of the tent, check here. There was plenty of firewood in the area, but it was all wet. One plus to having a vehicle nearby was we had brought a little dry wood. This starter supply was enough to get a warm blaze going well enough that careful feeding of the damp wood continued to keep the flames strong. The vehicle also served as a cache for extra water (and other liquids). Night’s are long in November, but I slept through the night, warm and dry. Despite the wind, the Convert’s fly remained taut and quiet. The temperature was in the mid 20s by morning. In Bill’s tent, his water froze. Mine did not. In addition, I had no issues with condensation whatsoever. For cold weather camping, the Convert was an impressive tent. In the morning, the sky was clear but the cold front had done it’s job. Bill’s socks, which had gotten wet on a creek crossing, were frozen solid. He was able to send of photo of them to his son for his enjoyment. We hiked a few more miles in the park, just to explore a bit then headed back in time to watch a little football. Logan Trail is located in Tar Hollow State Park and Forest, near Chillicothe. Head east from town on US 50 for less than ten miles to State Rt 327 North. Ten more miles will bring you to the Entrance to Tar Hollow State Park. Camp permits are available at the camp office and signs can direct you to the fire tower. The South Loop is approximately 9 miles long if you don’t visit Camp Dulen. Per my Garmin, the elevation varied between 680 feet to 1,270 feet. The South Loop is generally rolling with two major drops and climbs of 400+ ft (three if you make the wrong turn). There were several creek crossings, but, even with recent rain, none were overly difficult. Overall, the South Loop of Logan Trail provides a relatively challenging hike with some beautiful forested scenery. Unlike the nearby trails of Hocking Hills though, there is no need to worry about crowds. The Midwest is certainly not famous for long trails or epic mountain hikes. For example, here in my home state of Ohio, the highest point is 1,550-foot Campbell Hill, which can be scaled via sidewalk. However, there are plenty of beautiful hiking options across the Midwest just the same. 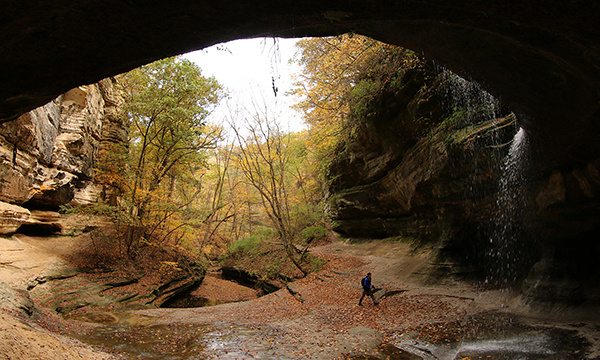 Here are a few of the best hikes in the Midwest. Nestled in southeastern Ohio, Hocking Hills State Park consists of over 2,300 acres of spectacular gorges, waterfalls, and recess caves. Various trails totaling 26 miles allow day hikers to choose an easy or more strenuous trip. The deep gorges are unlike most of the state and have protected remnant populations of hemlock and Canada yew that flourished there 10,000 years ago during a much cooler time. Camping and cabins are available in the park. The area is extremely popular, so avoiding summer weekend afternoons and other high-use times allow for a more natural experience. My personal favorite hike is from Old Man’s Cave through the gorge to Cedar Falls, then returning on the Gorge Overlook Trail, about six miles total. For those needing more room, the park is adjacent to 9,200 acre Hocking State Forest. Hocking Hills State Park can be reached from either US Route 33 or Ohio Route 56 southeast of Columbus. Photo courtesy of Illinois Department of Natural Resources. Canyons, waterfalls, and tall bluffs are not what most people expect when hiking the “flatland” of the Midwest, but that’s exactly what day hikers find at 2,600-acre Starved Rock State Park. Thirteen miles of trails wander through 18 canyons and to spectacular overlooks of the Illinois River. Legend has it that in 1769 a group Ottawa, seeking revenge for the killing of their chief, Pontiac, attacked a group of Illiniwek camping along the Illinois River. In an attempt to escape, the Illiniwek climbed the high butte above the river, but were trapped there by the Ottawa. The standoff continued until the Illiniwek on the butte starved, thus the reason for the park’s name. There’s now a lodge/restaurant located on a nearby bluff so starvation, or even hunger, is no longer an issue. Starved Rock is the most popular state park in Illinois, so keep that in mind when picking a time to visit. The views are worth the crowds, though. The park is west of Chicago. Take I-80 W to I-39 S (Exit 79A) to IL 71 E. You’ll go right by the entrance. Courtesy of the National Park Service. Located at the far northwest corner of Indiana along the shore of Lake Michigan, Indiana Dunes National Lakeshore is comprised of 15 separate parcels of land with a total of around 15,000 acres. These individual plots host a wide variety of habitats and an even wider variety of day hike options. Perhaps the hardest part of hiking here is deciding which of the 14 trail systems (totaling 50 miles) to tackle first. Habitats you can visit include hardwood forests, oak savannas, riparian corridors, prairie, wetland and, of course, dunes and beaches. Between the lake and the variety of environments, the park draws a large variety of birds, despite being in an otherwise urban/industrial area. Indiana Dunes is located between Gary and Michigan City, IN, with Route 12 passing near most of the parcels. Looking for a weekend campout that’s easy on logistics or perhaps a trail for that first overnight backpacking trip? Well, you have found it at 28,000+ acre Zaleski State Forest. Various loops can be configured to result in hikes of ten, 16, 18, 23 or 29 miles. The terrain is rolling, but not extreme and nearly always in forest. The trail itself is well maintained and (almost) too well marked. I’m still looking for an old photo that showed six blazes at once. A couple overlooks and small recess caves add to the interest. Zaleski was the site of some of my earliest backpacking and a great place to learn those first lessons. (Such as you don’t need six pounds of trail mix for a two-day trip.) The trail is located between Chillicothe and Athens. Take US Route 50 to State Route 278 north. Encompassing nearly 13,000 acres in south central Indiana, The Deam Wilderness (Indiana’s only designated wilderness) is located within Hoosier National Forest and boasts 37 miles of trails. It also touches Lake Monroe, the largest man-made body of water within the state. The Hickory Ridge Fire Tower, at 110 feet tall, gives some impressive views of the area. Terrill Ridge Trail leads to some excellent campsites near a pond, and the Peninsula Trail provides some striking overlooks of Lake Monroe. At the end of the peninsula are some great lakefront campsites as well. The wilderness is located south of Bloomington, IN. Take Route 446 to Tower Ridge Road to multiple trailheads. There are no fees or permits required to camp there. Stretching 42 miles along the south shore of Lake Superior, the Lakeshore Trail features incredible overlooks, sandy beaches, waterfalls, lighthouses, and plenty of camping. The distance is also shared with the North Country Trail, which continues a bit further in each direction (approximately 4,600 miles total). Hiking is moderate with some climbs between bluffs overlooking the lake down to stretches near the water itself. There are 11 backcountry “campgrounds” along the way that can be reserved through recreation.gov. Most camp areas have community fire rings, bear-proof lockers, and water from either streams or that big nearby lake. Bring a water filter. There are shuttle services available for those wanting to hike the entire distance one way. Pictured Rocks National Lakeshore is located on the south shore of Lake Superior in Michigan’s Upper Peninsula, between the communities of Munising (west) and Grand Marais (east). Alger County Road H-58 provides access throughout the Lakeshore. A thru-hike of the Ozark Trail is 230 miles, meandering through the St. Francois Mountains of southeast Missouri. Overall, the hiking is moderate with drops into and climbs out of numerous valleys. Elevation changes are generally well under 1,000 feet but enough for some great views. Count on wet stream crossings on a regular basis as well. Water is not generally an issue, though plan on filtering all sources. Resupply is off trail though several hotels along the route will offer shuttles to those that rent a room. In addition, shuttles are available for the length of the trail so only one vehicle is required. The northernmost trailhead is reached by heading west from St Louis on I-44 to south on Highway H past Leasburg. Photo courtesy of the Superior Hiking Trail Association. The Superior Hiking Trail runs 255 miles, generally along a ridge above the north shore of Lake Superior. The linear route travels nearly to the Canadian border from Duluth. The trail actually continues 41 additional miles south through the city toward the Wisconsin border. However, as no backcountry camping is allowed through this stretch, it is not considered to be part of a traditional thru-hike. Not surprisingly, the main highlight of the trail is the nearby presence of the big lake the Ojibwa people (and Gordon Lightfoot) called Gitchi Gami (Big Water). Stunning views of the water are common. Numerous streams and rivers flow into the lake and the path is often situated to provide a view of a spectacular waterfall as the flow drops off the ridge down to the lake. The trail itself doesn’t have huge climbs. The lake sits at around 600 feet above sea level and the high point on the trail is a bit over 1,200 feet higher. Consider the trail to be moderate to challenging though. Hiking is rarely on flat ground, with steep elevation changes between river valleys and ridgetop. There are no permits or fees to hike the trail. Campers are required to stay at one of 93 established backcountry campsites. Each site offers multiple tent pads, a fire ring, and a latrine. Typically, a water source is nearby. The southern terminus for a traditional thru-hike is the Martin Road trailhead. From I-35, take 21st Ave. East Exit #258. Turn left on 21st Ave. E. and go 0.7 miles up hill. Turn right on Woodland Ave. and go 1.2 miles. Turn right on Snively Rd. and go 1.0 miles to intersection with Jean Duluth Rd. Continue straight on Jean Duluth Rd. and go 1.9 miles. Turn left on Martin Rd. and go 1.2 miles to trailhead parking lot on left. Two shuttle companies are in the area for those wanting a one-way hike. The Buckeye Trail is an interesting animal. I put it in this best hikes in the Midwest list due to its sheer length while staying within one state. It wanders 1,444 miles all over the state of Ohio in a big loop that also has a couple of smaller loops and spurs included. In one spot or another, the trail shares tread with most of the trails in the state I’ve ever hiked. If you want to thru-hike a trail that few others have completed, this could be your trail. If you want a thru-hike that includes hundreds of miles of road walks and significant stretches with no camping options, this could also be your trail. There are a lot of good options for section hikes, however. The pathway travels through Ohio’s only national forest, Cuyahoga Valley National Park, 18 state parks, five state forests, four wildlife areas, eight Ohio Historical Society properties, six Watershed Conservancy lands and 18 county or Metropark lands. Whatever length and challenge level of a hike you are looking for, chances are you can find it on the Buckeye Trail. jrahtz24 on What Am I Looking At? Dennis Timberlake on What Am I Looking At?